Peel papaya and remove seeds, chop into bite sized pieces. 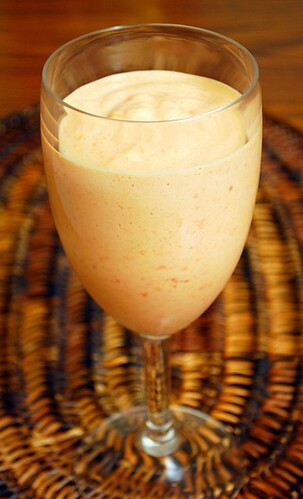 Transfer papaya to a blender and pulse to break down. Add ice cream (and Creme de Cassis if using) and blend until smooth and incorporated. Pour mixture into a serving dish or serving glass and garnish with mint. Serve immediately. I'm not sure if I've ever had papaya but now I'm wondering when I can get up to Whole Foods to pick one up!